The hills of Kentucky echo with the sweet sounds of bluegrass jamborees. Did you know that the same can be heard at Bookmans too? From our Yasuma bowl back mandolins to our long neck banjos, Bookmans has that classic sound, ready for your fingertips. The serene sound of a Chinese garden, for example, is complete with a soft stream, chirping birds, and a gently plucked guhzeng. Wait, a what? One of the most enchanting instruments on earth, the 21 string guhzeng is a rarity to behold. Stop in today to play one of ours. We also offer new, high-quality instruments from Eastman and Cordoba. These manufacturers ensure that each note played on their instruments express every nuance possible, providing an unforgettable performance. 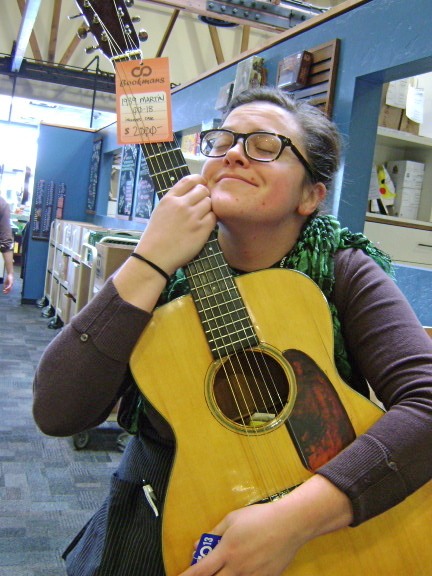 From mandolins and flat-top boxes to ukuleles and flamenco guitarras, Bookmans has the sound that you know and love. Bookmans is busy, filled to the brim with life, energy, and enthusiasm for all things creative. We love to hear musicians play their favorite songs. We have a knowledgeable staff to help answer questions about our large selection of recording equipment and amplifiers. Do you have a child who is starting band or orchestra at school? Not only do we offer affordable instruments at a great price, we also offer a rental program with Milano Music. Stop by today to see what Bookmans stores have for you! To learn the ins and outs of choosing the right kind of guitar for you, be sure to check out Beginner Guitar HQ’s article How to Choose the Best Guitar, 15 to Consider According to Science. Because we have a dedicated luthier, it is very likely that a Bookmans near you has violins. However, we don’t guarantee stock, so you will have to call the store to confirm. Calling the store will also give you a good idea of what sorts of violins we have available. Please keep in mind that we can transfer between stores. If you find a violin that you like at a Bookmans that isn’t your home location, you can ask that it be sent to your home store. Do you have any 12 acoustic guitars. Please let me know what you have and their prices. What are your favorites among those in stock? Powerful thoughts to all of you. Do you take ocarinas? I bought this ocarina and never got around to using it and now it just sits in my room. If I sell mine to you how much will I get? Thanks! Do you have an online inventory of guitars to look at? I’m looking for a Gibson Les Paul style electric guitar. Thanks! Hi John, We do not maintain an online inventory for any of our product lines. You can call the stores at any time (http://bookmans.com/stores) to ask what they have on the floor. You might also contact our musical instrument repair shop at 520.449.1722 or via email at instrumentrepairs@bookmans.com. I hope you can get your hands on that Les Paul! Any English concertinas in stock at Mesa? I’m looking for a student Key C Oboe. Do you have one? Hi Teri, The stores don’t share an electronic inventory, so I can’t be sure what specific items they have in stock. You can call or email the stores directly. Their information is on our Stores Page. You can also call our Musical Instrument Repair Shop in Tucson (520-449-1722). They only do repairs, but they may have an idea about which store has the widest oboe selection. do you have any Ukuleles, Guitaleles, or small guitars? We most definitely have ukes and small guitars. We don’t maintain an electronic inventory, so the only way to know for sure what specific items we have is to check our shelves. We’ll be happy to look for you. Just give your nearest Bookmans a call or shoot them an e-mail. Store contact information can be found on our Stores Page. We don’t keep an electronic inventory, so I can’t look it up, but we very likely do have violas at Bookmans Speedway. If not at Bookmans Speedway, then Bookmans Grant or Bookmans Ina will have one to meet your needs, which we can transfer for you. To get a better idea of viola brand names, models and costs, you can call Bookmans Speedway directly at 520.748.9555. Looking for a ukelele for college grad. Anything? We have ukes at every location and just received a new shipment. Grab your trade credit and head for your closest Bookmans. If you want a specific type, give us a call and we’ll check our shelves. I recommend you come in and talk to our musical instrument staff to get a personalized recommendation. Looking for an Alto saxophone, prefer a professional level or advanced student model! Please notify me if anything comes up! Hi Darlene, it’s very difficult to comply with notification requests, especially as we do not maintain an electronic inventory. Please contact any of our stores directly and they will check their shelves for you. I also encourage you to contact our musical instrument repair shop as they can also check their holdings and transfer a sax to the store nearest you. In fact, this latter suggestion may be the more productive route. I have a broken guitar, its a good one but the neck is broken. Are you able to fix this problem. If so, what is the estimated price for it. Thank you so much for reaching out. Your best bet is to contact the Musical Instrument Repair Shop directly. I’m sure they can give you a better idea on the cost and hopefully get your guitar fixed and back to rockin’ rollin. I’m looking for 2 ukuleles. Do you have any at this time? Thanks for commenting! We most likely have two ukes for you. However I would suggest you contact your local Bookmans to be sure. A staff member can put one on hold and answer any questions you might have. Best of luck. Do you have cellos, tenor saxophones or sheet music for tenor saxes? I have a yamaha keyboard , PSR E403 and a violin that has never been played (with a nice case). Is there a demand for my items? Hello there! All of our stores buy, sell and trade musical instruments all the time, and it just depends on what each individual store can sell. I would contact your local Bookmans and ask, or better yet, stop by with the items. I wish I could give you a more specific answer but each store varies in what it buys and sells. Best of luck, though! Let me know if I can help in any other way. Hi, do you have any accordions? Hey P! I’d give your local Bookmans a call. Each of our stores get so many items through their doors a day, along with having different stock of musical instruments at each location. I’ve personally seen some pretty awesome accordions in store – so I think you have a good chance of finding one. Let me know if I can help more, and best of luck. I am just wondering if used keyboards are available at 50-100 USD. I have just started piano lessons and I use it to practice? Hello Razan! Your best bet is to call your local store directly – and you can find their number here. Unfortunately we do not have an online inventory that I can access to check on the product availability for you. Hope this helps! I have an alto saxophone that I would like to sell. Do you have an exchange policy for the saxophone to exchange for an acoustic guitar? Hi Susan. Unfortunately it’s our policy to only provide quotes at our deal counter. I am unable to give you any idea of what we would take your saxophone for or what the price difference would be between that and an acoustic guitar. Your best bet is to visit your local Bookmans with the saxophone so they can make a fair assessment of it, or you can always call and see if the stores can give you some more specific information since our inventory and what we buy, sell and trade is directly related to the area in which a particular Bookmans is located. You can find that information at bookmans.com/stores. Hope this helps! Do you guys have any drums sets? if so, what are the prices and quality? Unfortunately we do not maintain a digital inventory so you would have to call your local Bookmans to see if they have drums in stock and what they are going for, but typically we do buy and sell drums, I just can’t guarantee stock at any particular store as it is ever changing. You can find the info for all stores at bookmans.com/stores.